Citation Information: J Clin Invest. 2006;116(8):2201-2207. https://doi.org/10.1172/JCI28163. 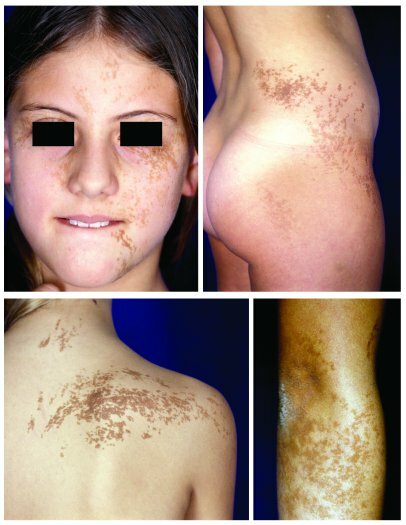 Patient 29 displayed a systematized epidermal nevus of the common soft type with involvement of the face (bilateral), the right scapular region, the right arm, the right hip, and the right thigh. Abnormalities of the skeletal or nervous system were not present. A biopsy was taken from the epidermal nevus of the right forearm. This epidermal nevus revealed an R248C FGFR3 gene mutation. DNA isolated from the blood of this patient revealed WT status at codon 248, excluding a germline mutation.